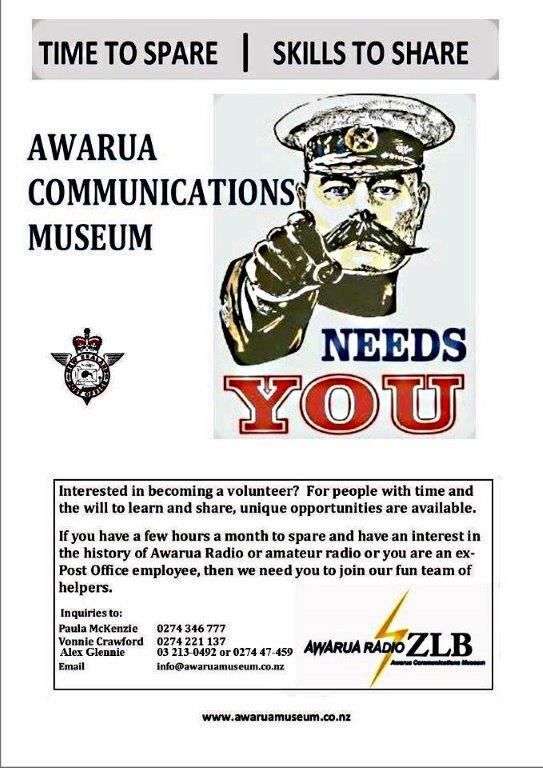 As a not-for-profit organisation maintained by volunteers, the Awarua Communications Museum relies strongly on the support of our friends. This page is an opportunity to thank those people and to suggest other ways in which support can be provided to help cover our ongoing costs. We are very grateful to the organisations that have provided us with funding grants. This money, along with our own efforts, has enabled us to refurbish our building and grounds, create The Regal theatre and communications display area, and purchase modern display and security systems. Our thanks go to Community Trust of Southland, Southland Regional Heritage, Invercargill City Council, Southern Trust, Te Papa, Lion Foundation, Lotteries Grant Board, ILT Foundation and The Awarua Station Farm Trust. We also acknowledge the many kind donations of time, effort, money and items that have been received from a wide group of people. We appreciate the consideration our neighbours at Awarua have shown us while we have been building our museum. In particular, we are grateful for the access they allowed us around the farm during the celebration of Awarua Radio's centenary event in January 2014. Also important to us are our members and followers from near and far who share our passion for communications heritage. Thank you team! Here are some thoughts about how further support might be provided to the museum. If you have a unique communications item that no longer suits your needs, you may wish to check with us and see if it is something that would complement the display items we have. While we may not accept every item offered, we would definitely appreciate the opportunity to review it. Like every museum we have limited storage space, so need to be a bit choosey about what to accept. Often an item will have an interesting story associated with it. That story could be more valuable to us than the item! Please consider emailing us any stories or memories that might suit the museum or our website's needs. We also have access to trained oral history recording specialists, so a well-guided yarn is also a possibility. Nowadays it is easy to put pictures and film into digital form. We would be interested in receiving emails with relevant digital pictures, films or links that would enhance the museum records collection or website. Obviously the better quality and image size provided, the more we can work with it. Please don't post any physical media to us unless that has been specifically requested. Pictures without captions or background information are of little use to us, so your thoughts about the content of all images and films is a valuable part of any material you might offer us. Also, please confirm you are the owner and copyright holder, or have copyright approval so we may legally use the material supplied to us. When you next revise your will you may wish to consider adding a small bequest to the Museum. Again, any such generosity would be most appreciated and would help us maintain and evolve our unique facility. The Awarua Communications Museum is keen to support school groups. Teachers with an interest in communications history and equipment are welcome to contact us regarding museum availability and programme material to suit their needs. Likewise, business groups or clubs are welcome to contact us to see if use of our facility would suit meeting or event activities. Please email any inquiries to our contact address shown on the Welcome page.